We discuss the structural and optical characteristics of GaN nanowires (NWs) grown on Si(111) substrates by a plasma-assisted molecular-beam epitaxy. The GaN NWs with high crystal quality were formed by adopting a new growth approach, so called Ga pre-deposition (GaPD) method. In the GaPD, only Ga was supplied without nitrogen flux on a SiN/Si surface, resulting in the formation of Ga droplets. The Ga droplets were used as initial nucleation sites for the growth of GaN NWs. The GaN NWs with the average heights of 60.10 to 214.62 nm obtained by increasing growth time. The hexagonal-shaped top surfaces and facets were observed from the field-emission electron microscope images of GaN NWs, indicating that the NWs have the wurtzite (WZ) crystal structure. Strong peaks of GaN (0002) corresponding to WZ structures were also observed from double crystal x-ray diffraction rocking curves of the NW samples. At room temperature, free-exciton emissions were observed from GaN NWs with narrow linewidth broadenings, indicating to the formation of high-quality NWs. 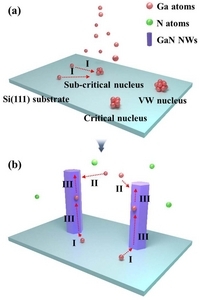 In the past several years, III-V semiconductor nanowires (NWs) have been actively studied in terms of their fundamental physics and potential device applications due to their superior electrical and optical properties [1–3]. 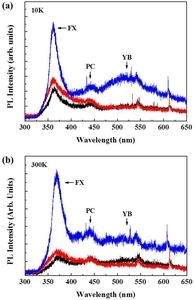 The III-nitride materials have been largely studied in the field of optoelectronic devices such as light-emitting devices and photosensors, which can cover deep ultraviolet (UV) to near infra-red (NIR) window by controlling the composition of (Ga,In,Al)N. However, the formation of high-quality AlGaN with high Al content to obtain UV wavelengths and InGaN with high In content to get the NIR window, used as active medium for optoelectronic devices, is very difficult due to inherent physical properties of Al and In [4–6]. Recently, many researches have been actively performed to use nanostructures instead of thin films for wavelength broadening of III-nitride material system. For examples, GaN, AlGaN, and InGaN NWs formed on Si substrates have been investigated for the applications of light-emitting diodes and photosensors [7, 8]. Theoretically, GaN NWs formed on Si (111) can be used as an active medium for optoelectronic devices due to their high exciton binding energy and relatively fast carrier mobility [9,10]. One of the most well-known approaches for the formation of Si-based GaN NWs is vapor-liquid-solid (VLS) process, using metal catalysts acting as nucleation seeds of NWs [11,12]. However, it is still difficult to form GaN NW with high crystal quality because of the potential diffusion of metal catalysts into GaN NWs, which may result in chemical contamination [13,14]. Y. Wang et al. reported that Au and Ni, which are typically used as catalytic metals for VLS growth of GaN NWs, introduced deep-level traps in the semiconductor band gap, limiting the performances of optoelectronic devices . To reduce the chemical contamination caused by the metallic catalysts, catalyst-free or self-catalyst methods have been used for the formation of GaN NWs on Si using VLS or Volmer-Weber modes [15–17]. However, it is still difficult to form Si-based GaN NWs with high crystal quality because of the large difference in material parameters between GaN and Si, including lattice constants and thermal expansion coefficients. That is, catalyst-free GaN NWs on Si substrates showed various shapes and had many structural defects [15,17]. J. Ristić et al. reported the spontaneous nucleation and growth mechanisms of GaN nano-columns on Si(111) substrates, which may also apply to form III-nitride nanostructures . F. Schuster et al. reported the fundamental role of the substrate material, surface orientation, and termination on the nucleation and growth of GaN NW . However, more detailed discussion on the initial growth behavior, internal structure, and optical properties of GaN NWs is necessary. From this consideration, first of all, it is required to form GaN NWs with high crystal quality and uniformity. In this paper, we report structural and optical properties of GaN NWs formed on Si(111) substrates by a new growth method, Ga pre-deposition (GaPD) technique. In GaPD growth method, Ga droplets are first formed as initial nucleation sites for the successive NWs on Si (111) substrates. The structural and optical characteristics of the GaN NWs were investigated by field-emission scanning-electron microscopy (FE-SEM), double crystal x-ray diffraction (DCXRD), and photoluminescence (PL) spectroscopy. GaN NWs were grown on Si(111) substrates by a plasma-assisted molecular-beam epitaxy (PA-MBE) with a solid Ga source and a N-plasma cell. A N-plasma flux was obtained by applying an RF generator with a frequency of 13.56 MHz to N gas with a purity of 99.9999 % [20,21]. Before the growth of GaN NWs, native oxide on Si(111) substrates was removed by subsequent thermal annealing at a substrate temperature of 900 °C inside a PA-MBE reactor. Only nitrogen (N) plasma source was supplied to a Si(111) substrate at a temperature of 800 °C for 10 minutes (nitridation process) to form a thin SiN layer with the thickness of 27 nm. After the nitridation process, only Ga flux with a beam equivalent pressure 4.62 × 10−8 torr was supplied on the SiN/Si(111) surface for 6 seconds to form Ga droplets, working as initial nucleation sites for GaN NWs. Figure 1(a) schematically shows the formation process of Ga droplets on the SiN/Si(111) surface by supplying only Ga atoms without N-plasm source. When Ga atoms are supplied to the SiN/Si surface, the SiN phase and Ga atoms bond SiGaN to form nuclei . Thereafter, Ga adatoms migrate to the sub-nucleus to form a nucleus (I). Finally, Ga droplets with sufficient size are formed to allow Volmer-Weber growth of successive NWs . Meijers et al. reported the use of Ga droplets for the formation of GaN NWs, where the Ga ball-like features were formed due to the reduction of Ga migration by the excess N atoms . In our approach, the initial nucleation characteristics of GaN NWs were controlled by manipulating shape and size of Ga features via deposition time and growth interruption. In Fig. 1(b), Ga and N-plasma fluxes were simultaneously supplied to form GaN NWs via the initial nucleation sites of the Ga droplets (II). For the growth of GaN NWs, Ga adatoms migrate towards the top of the NWs because of chemical potential energy (III) . As schematically shown in Fig. 1(b), the GaN NWs with high crystal quality and uniformity can be grown on the SiN/Si surface by the GaPD method. We controlled the diameter, height and morphology of GaN nanostructures by varying the supply time of Ga atoms in the GaPD method, which is different from the previous approaches using Ga droplets [23,25]. GaN NWs were grown on the Ga droplets formed on a Si(111) substrate at a substrate temperature of 915 °C and a V/III ratio (defined as the flux ratio of N-plasma to Ga) of 108 for 90 minutes (NW1 sample). To investigate the growth behaviors depending on the vertical position of GaN NWs, growth time was respectively increased by 1.5 (NW2 sample) and 2 (NW3 sample) times longer than that of the NW1 sample under the same growth temperature and V/III ratio. To analyze the structural properties of the NW samples, FE-SEM (Hitachi Su-70) and DCXRD (MAX-2500) were used. The accelerating voltage for FE-SEM measurements was set to 10 keV. The PL system was used to analyze the optical characteristics of the GaN NWs. A diode-pumped solid-state laser with the wavelength of 266 nm was used as an excitation source. The luminescent light from the NW samples was detected by a charge-coupled device with an electrically controlled cooling system. Figures 2(a)–(c) show the cross-sectional (left) and plan-view (right) FE-SEM images of the NW1, NW2, and NW3 samples, respectively. The average heights (diameters) of the NW1, NW2, and NW3 were measured as 60.10 (43.62), 157.01 (65.48), and 214.62 nm (65.71 nm), respectively. The top surfaces of the plan-view FE-SEM images of GaN NWs in Fig. 2 clearly show the hexagonal shapes, which are evidences for the formation of the wurtzite (WZ) crystal structure. The inset of each plan-view image is a three-dimensional one for GaN NWs, where the hexagonal facets are clearly observed. This also indicates that the GaN NWs have the WZ crystal structure. Figure 3 shows the DCXRD of the NW samples grown on Si(111) substrates. The intensity of the DCXRD rocking curve of the GaN NWs is relatively stronger than that of the Si(111) substrate. This is related to the SiN layer formed during nitridation process. That is, the x-ray hardly passes through the SiN layer to Si . The DCXRD peaks are in good agreement with the Joint Committee for Powder Diffraction Standards (JCPDS) data for the GaN in the WZ structure and the Si in the cubic structure . That is, the DCXRD peaks corresponding to GaN(0002) planes for the NW samples are located at 34.67°, 34.66° and 34.65° for the NW1, NW2, and NW3 samples, respectively, demonstrating that the GaN NWs can be indexed to the WZ crystal structure. The inset is the magnified DCXRD curves for the GaN(0002) phase, where the peak positions for the NWs were slightly decreased with increasing the average height of the NWs. This is related to the reduction in tensile strain, caused by the large lattice mismatch between GaN and Si, with increasing the height of the NWs . The peak intensity of the DCXRD rocking curves increases with increasing height of the GaN NWs. This is because as the height of the GaN NWs becomes longer, the amount of the WZ GaN structure increases. The full width at half maximum (FWHM) was measured as 0.30, 0.25 and 0.20° for the NW1, NW2, and NW3 samples, respectively. The FWHM is very narrow compared to those of the previous works [29,30], which indicates that the crystal quality of the GaN NWs in this work is relatively better. Figures 4(a) and 4(b) show the PL spectra of the GaN NW samples, measured at 10 and 300 K, respectively, at which the excitation power was 3 mW/cm2. The free-exciton (FX) peaks in the PL spectra of all the NW samples were clearly observed. Typically, it is very difficult to observe the FX peaks from GaN NWs, largely due to insufficient radiative recombination of carriers inside the NWs over the non-radiative recombination caused by defects and surface states . In Fig. 4(a), the FX peaks were measured as 363.31, 361.20 and 361.20 nm for the NW1, NW2, and NW3 samples, respectively. The FX peaks of the NW2 and NW3 sample were slightly blue-shifted compared to that of the NW1 sample. If we only consider the diameters and heights of NWs, the NW1 sample seems to emit the shortest wavelength among the samples. However, considering exciton Bohr radius and structural dimensions of the NW samples, size quantization effect may be estimated to have very little effect on the emission wavelength [32,33]. Therefore, the blue-shift in the emission wavelength for the NW2 and NW3 samples with respect to the NW1 sample can be explained by reduction in strain, which was confirmed at the DCXRD rocking curves. The intensities of the FX peaks for the NW2 and NW3 samples are 1.01 and 1.05 times stronger than that of the NW1 sample, respectively. This is attributed to the improvement in internal crystal quality and the increase in effective volume for the NW2 and NW3 samples, which were already confirmed from the FE-SEM images and DCXRD rocking curves. For the NW samples, a broad yellow-band (YB) peak is weakly observed from 473 to 564 nm, which are related to defects [9,34,35]. Also, there is a peak around 434 nm at the PL spectra measured at 10 and 300 K, which is originated from the polycrystalline (PC) GaN [34,36]. The intensity of YB (PC) peak for the NW3 sample is 1.09 (1.20) and 1.10 (1.17) times stronger than those of the NW1 and NW2 samples, respectively. This is attributed to the increase in the effective number of defects and the PC-GaN with increasing the total volume of GaN. However, the peak intensity ratio of FX to YB for the NW3 sample was measured as 1.16, which is relatively higher than those of the NW1 (1.05) and NW2 (1.08) samples. Also, the peak intensity ratio of FX to PC shows the same tendency. 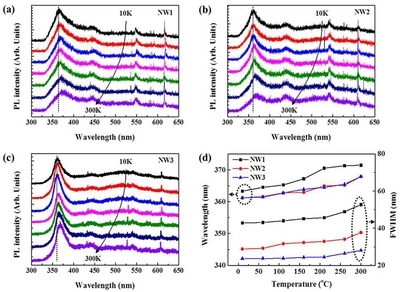 These results are related to the increase in the effective volume of GaN NWs with high crystal quality contributing to light emission and the reduction in the amount ratio of defects and PCs with respect to total crystal volume. Once again, the PL results are consistent with the discussion on the DCXRD rocking curves. In Fig. 4(b), the FX peaks were measured as 371.45, 367.90 and 367.89 nm for the NW1, NW2, and NW3 samples, respectively. The FWHMs at the FX peaks in the PL spectra, corresponding to the size uniformity of GaN NWs, were measured as 52.71, 37.72, 28.10 nm for the NW1, NW2, and NW3 samples. 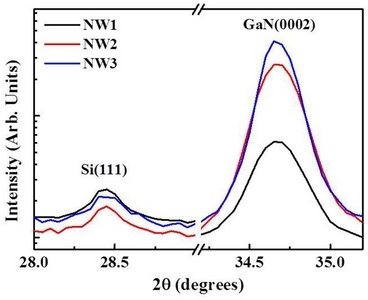 The FWHM for the NW3 sample is much narrower than those of the NW1 and NW2 samples, indicating that the size uniformity of GaN NWs is relatively better. Figures 5(a)–(c) show temperature dependence of the PL spectra of the NW samples, measured at the temperature ranging from 10 to 300 K. The emission wavelengths of the NW1, NW2, and NW3 samples were red-shifted with increasing temperature, respectively. The red-shift with temperature is ascribed by the well-known dilation of lattice and the electron-lattice interaction. Figure 5(d) shows summary on the FX peaks and FWHMs of the NW samples with respect to temperature. The FX peaks of the NW1, NW2, and NW3 samples at 300 K were red-shifted by 8.14, 6.70, and 6.69 nm from those measured at 10 K, respectively. At the same time, the FWHMs of the NW samples are gradually increased with increasing temperature. The difference in the FWHM of the FX peak between 10 and 300 K is calculated as 4.39 nm for the NW3 sample, which is relatively smaller than those of the NW1 (9.86) and NW2 (8.89 nm) samples. This can be explained by the fact that the size distribution of the GaN NWs for the NW3 sample is more uniform than those of the NW2 and NW3 samples. As shown in the FE-SEM images of Fig. 2, since the GaN NWs were closely packed, the carriers thermally activated from certain small NWs by external temperature could be trapped other large NWs [37–39]. For the NW3 sample with better size uniformity compared to the NW1 and NW2 sample, the thermal activation and recapture process of carriers should be relatively small. As a result, the variation in the FWHMs with respect to temperature is relatively small for the NW3 sample compared to the other NW samples. In conclusions, GaN NWs with high crystal quality and uniformity were successfully grown on Si(111) by using newly-suggested GaPD method in a PA-MBE. In the FE-SEM images for GaN NWs, lateral size and height of GaN NWs were significantly varied with respect to growth time. The DCXRD peaks indicated that the portion of the WZ crystal structure inside the NWs was significantly increased with increasing the height of the GaN NWs. At room temperature, the strong FX emissions were observed from GaN NWs with narrow FWHMs indicating that the high-crystal quality NW were formed by controlling the initial growth behaviors of Ga atoms using pre-deposited Ga droplets. Fig. 1. (a), (b) Schematic illustration for the formation of GaN NWs by using GaPD. Fig. 2. 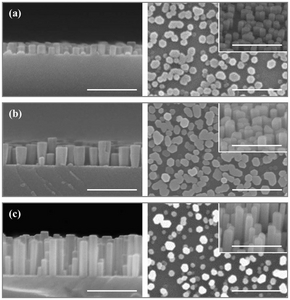 Cross-sectional (left) and plan-view (right) FE-SEM images for the (a) NW1, (b) NW2, and (c) NW3 samples, where the insets are the three-dimensional views. (Scale bar: 300 nm). Fig. 3. DCXRD rocking curves of the NW samples grown on Si(111) substrates. Fig. 4. PL spectra for the GaN NW samples measured at (a) 10 and (b) 300 K.
Fig. 5. Temperature dependence of PL spectra for the (a) NW1, (b) NW2, and (c) NW3 samples measured in temperature ranging from 10 to 300 K.
Ford, AC, Ho, JC, Chueh, YL, Tseng, YC, Fan, ZY, Guo, J, Bokor, J, and Javey, A (2009). Nano Lett. 9, 360. Offermans, P, Crego-Calama, M, and Brongersma, SH (2010). Nano Lett. 10, 2412. Han, S, Choi, I, Lee, K, Lee, CR, Lee, SK, Hwang, J, Chung, DC, and Kim, JS (2018). J Electron Mater. 47, 944. Lee, K, Lee, CR, Chung, TH, Park, J, Leem, JY, Jeong, KU, Kim, JS, and Cryst, J (2017). Growth. 464, 138. Lee, K, Lee, CR, Lee, JH, Chung, TH, Ryu, MY, Jeong, KU, Leem, JY, and Kim, JS (2016). Opt Express. 24, 7743. Lee, JH, Yang, WW, Chang, DW, Kwon, SS, and Park, WI (2018). ACS Appl Mater Interfaces. 10, 14170. Deshpande, S, Frost, T, Yan, LF, Jahangir, S, Hazari, A, Liu, XH, Mirecki-Millunchick, J, Mi, ZT, and Bhattacharya, P (2015). Nano Lett. 15, 1647. Park, SH, Hong, WP, and Kim, JJ (2017). Superlattice Microst. 109, 254. Rojas-Briseno, JG, Miranda-Pedraza, GL, and Martinez-Orozco, JC (2017). Phys Status Solidi B. 254, 1. Maliakkal, CB, Hatui, N, Bapat, RD, Chalke, BA, Rahman, AA, and Bhattacharya, A (2016). Nano Lett. 16, 7632. Kuykendall, TR, Altoe, MVP, Ogletree, DF, and Aloni, S (2014). Nano Lett. 14, 6767. Park, DW, Jeon, SG, Lee, CR, Lee, SJ, Song, JY, Kim, JO, Noh, SK, Leem, JY, and Kim, JS (2015). Sci Rep. 5, 16652. Wang, YW, Schmidt, V, Senz, S, and Gosele, U (2006). Nat Nanotechnol. 1, 186. Eftychis, S, Kruse, J, Koukoula, T, Kehagias, T, Komninou, P, Adikimenakis, A, Tsagaraki, K, Androulidaki, M, Tzanetakis, P, Iliopoulos, E, Georgakilas, A, and Cryst, J (2016). Growth. 442, 8. Fernandez-Garrido, S, Kaganer, VM, Sabelfeld, KK, Gotschke, T, Grandal, J, Calleja, E, Geelhaar, L, and Brandt, O (2013). Nano Lett. 13, 3274. Chen, RS, Tsai, HY, Chan, CH, Huang, YS, Chen, YT, Chen, KH, and Chen, LC (2015). J Electron Mater. 44, 177. Ristic, J, Calleja, E, Fernandez-Garrido, S, Cerutti, L, Trampert, A, Jahn, U, Ploog, KH, and Cryst, J (2008). Growth. 310, 4035. Schuster, F, Weiszer, S, Hetzl, M, Winnerl, A, Garrido, JA, and Stutzmann, M (2014). J Appl Phys. 116, 044307. Godejohann, BJ, Ture, E, Muller, S, Prescher, M, Kirste, L, Aidam, R, Polyakov, V, Bruckner, P, Breuer, S, Kohler, K, Quay, R, and Ambacher, O (2017). Phys Status Solidi B. 254, 1600715. Gao, FL, Wen, L, Xu, ZZ, Han, JL, Yu, YF, Zhang, SG, and Li, GQ (2017). Small. 13, 1603775. Xu, CK, Kim, M, Chung, SY, Chun, J, and Kim, DE (2004). Chem Phys Lett. 398, 264. Meijers, R, Richter, T, Calarco, R, Stoica, T, Bochem, HP, Marso, M, and Lüth, H (2006). J Cryst Growth. 289, 381-386. Consonni, V, Trampert, A, Geelhaar, L, and Riechert, H (2011). Appl Phys Lett. 99, 033102. Debnath, RK, Meijers, R, Richter, T, Stoica, T, Calarco, R, and Lüth, H (2007). Appl Phys Lett. 90, 123117. Wu, SK, Su, JJ, and Wang, JY (2004). Philos Mag. 84, 1209. Santana, G, de Melo, O, Aguilar-Hernandez, J, Mendoza-Perez, R, Monroy, BM, Escamilla-Esquivel, A, Lopez-Lopez, M, de Moure, F, Hernandez, LA, and Contreras-Puente, G (2013). Materials. 6, 1050-1060. Kaganer, VM, Jenichen, B, Ramsteiner, M, Jahn, U, Hauswald, C, Grosse, F, Fernandez-Garrido, S, and Brandt, O (2015). J Phys D: Appl Phys. 48, 385105. Dai, L, Liu, SF, You, LP, Zhang, JC, and Qin, GG (2005). J Phys Condens Matter. 17, L445. Kladko, VP, Kuchuk, AV, Stanchu, HV, Safriuk, VN, Belyaev, AE, Wierzbicka, A, Sobanska, M, Klosek, K, and Zytkiewicz, ZR (2014). J Cryst Growth. 401, 347. Auzelle, T, Haas, B, Den Hertog, M, Rouviere, JL, Daudin, B, and Gayral, B (2015). Appl Phys Lett. 107, 051904. Bailey, CG, Hubbard, SM, Forbes, DV, and Raffaelle, RP (2009). Appl Phys Lett. 95, 203110. Liu, BT, Guo, SK, Ma, P, Wang, JX, and Li, JM (2017). Chinese Phys Lett. 34, 048101. Li, JY, Chen, XL, Qiao, ZY, Cao, YG, and Lan, YC (2001). J Mater Sci Lett. 20, 757. Matys, M, and Adamowicz, B (2017). J Appl Phys. 121, 065104. Chin, AH, Ahn, TS, Li, HW, Vaddiraju, S, Bardeen, CJ, Ning, CZ, and Sunkara, MK (2007). Nano Lett. 7, 626. Demichel, O, Heiss, M, Bleuse, J, Mariette, H, and Morral, AFI (2010). Appl Phys Lett. 97, 201907. Shalish, I, Temkin, H, and Narayanamurti, V (2004). Phys Rev B. 69, 245401. Upadhya, PC, Li, QM, Wang, GT, Fischer, AJ, Taylor, AJ, and Prasankumar, RP (2010). Semicond Sci Technol. 25, 024017.